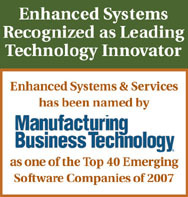 "Meeting the complex software needs of project-oriented manufacturers with easy-to-use solutions is all we do. And because we spend time everyday with companies like yours, no vendor knows your business better. Which is why, even when you have mixed-mode requirements that call for ETO, MTO, MTS, ATO and BTO manufacturing, our Finesse ERP software has you covered like no one else." We help you prepare ... even when you don't know what's coming. Finesse business applications operate on the Microsoft� SQL Server relational database. Using popular and unique technologies, including the Microsoft� Visual Basic (VB) programming language, Finesse provides a system that is easy to use, makes the most of your investment, fits into your enterprise and, most important, gets the job done efficiently, economically and quickly. In fact, our Finesse VB version uses the world's most popular programming language, opening the door to almost inexhaustible resources. And, as one of the least expensive environments, it reduces your initial investment as well as the cost of modifying and maintaining the systems, which can dramatically lower your total cost of ownership. In June 2003, Enhanced Systems proudly announced all Finesse modules now operate in the new Microsoft .NET technology environment. Microsoft created .NET to develop web services capabilities, improve security and reduce communication barriers between disparate platforms. This toolset is not another version of Microsoft Windows; it is the next-generation computing platform from Microsoft. The new .NET platform is a better tool for building and running applications software than the Windows operating system we know today. Communicating with customers and suppliers has never been easier. Our .NET version automatically makes every Finesse screen its own web page so any transaction system-wide may be performed over the internet. Accessing vital sales and service data for field-based personnel is as easy as an internet connection. .NET is a web-based architecture which eliminates the need for Finesse applications on desktops or laptops in remote locations. "The change to the Microsoft .NET Platform is as dramatic as the change from DOS to Windows. The software vendors that get in on the ground floor of this shift will have a huge advantage over the competition." Finesse operates on Microsoft� Windows NT�/Server 2000, 2003, Windows 2000/95/98 operating systems. Finesse software runs on all PC hardware platforms in both client/server and web-based environments. Our customers currently run as few as ten concurrent users up to 2500 for large, multi-site implementations. All Finesse applications are fully integrated with all other Finesse applications. This deep integration eliminates data redundancy and ensures that detail transactions are easily accessed throughout the system. But perhaps the biggest advantage is your ability to manage a far larger and more complex amount of data with greater efficiency. Finesse offers a familiar, easy-to-use Graphical User Interface (GUI) interface with intuitive windows. The application is built with Microsoft Visual Basic, the same language used to create MS Word, Excel and PowerPoint. So your users are already familiar with the look and feel of Finesse as well as how to navigate our software and where options can be found and how to use them. Finesse business rules and alerts are powerful tools to help you manage your business proactively by informing you the moment an out-of-range condition occurs. Enter rules and alerts once and they are applied globally, which means that if you enter a caveat or rule into the database, it will affect all applicable modules. For example, you can enter a rule that states, �IF a critical project material is received on the dock, THEN immediately notify the Project Manager and shop foreman.� Finesse does this without affecting the source code. Which means that when you update a module, you can simply copy your existing rules and alerts into the new version. Many businesses have multi-site, multi-plant requirements. But their communication, data transfer, data update and remote access requirements can differ widely. So can the right solutions. If you operate in such an environment, we�ll work closely with you to recommend the best options to meet your needs. Our flexible solutions can be fit to your architecture and will support both distributed processing and replication. Finesse makes importing and exporting data extremely easy. By using methodologies like the Microsoft� open database connectivity (ODBC) interface, common to most PC software, we enable you to use a wealth of third-party products in conjunction with your Finesse system. So if you create your budgets in Excel, you can still do that and import it into Finesse. Or your can export Finesse data into your favorite third-party reporting, presentation or graphics programs. It�s that simple.